Generations of home bakers have chosen Trex to make delicious recipes. 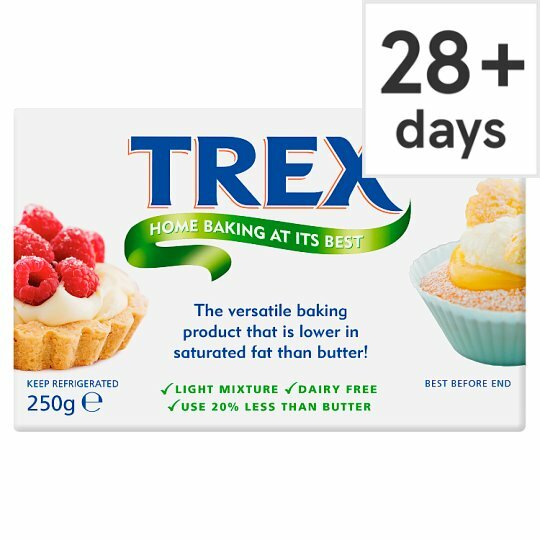 Easy to use and versatile, you can use Trex straight from the fridge for perfect pastry, cakes, biscuits and roasting. Why use Trex instead of Butter? You can use 20% less in your recipes because it contains no water. Trex is the only 100% vegetable baking fat. The versatile baking product that is lower in saturated fat than butter! This product has been specially manufactured and should reach you in a satisfactory condition. If it does not, please write to us, returning the lid. Please state the reason for your dissatisfaction and where and when bought.